Update: Scroll to the bottom to see my segment on The Doctors, and a behind-the-scenes video, too. 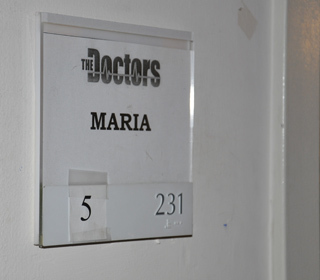 Last week I went to Hollywood to film a five-minute segment on the daytime TV show The Doctors. The show’s been a huge supporter of our team at Rodale, regularly featuring Liz V. from Prevention and Dave Z. from Men’s Health. Since it’s produced by Jay McGraw, Dr. Phil’s son, I had a chance to meet Dr. Phil too. In a hidden office on the back lot of Paramount Studios, I confessed to Dr. Phil that I was nervous to appear on the show—even though it’s taped (as opposed to live), it’s taped before a live audience and it was my first big TV appearance for my book Organic Manifesto (which officially came out yesterday!). “Aw, just use some blue cards,” he said. “Blue cards?” I asked, since I had never heard of them. Turns out they are 4-by-5-ish blue index cards that are considered camera-friendly. “Here, take these,” he said, and handed me a few blue cards and a Sharpie. “Remember, don’t read from them, just use bullet points and have them if you need them.” It must have been fate, since they matched my blue scarf perfectly. Turns out I wasn’t the only one who was nervous. Dr. Travis Stork, formerly of The Bachelor (and still single) was so nervous about meeting me that he asked the second question first, resulting in my actually needing my blue cards because I was so flustered. And then he couldn’t pronounce my name right, which I thought was kind of cute but seemed to annoy our segment producer. Anyway, like all TV I’ve done, it was over before I knew it (so much time prepping for such a brief moment!). 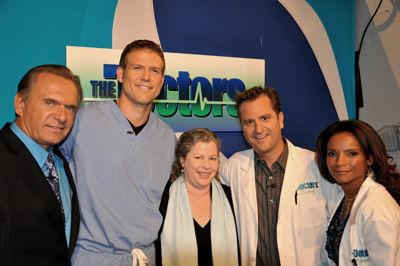 I got pictures with Travis and the other doctors—they are all big supporters of organic, and I am grateful to them for having me on their show! But I also got a tip from Dr. Phil I’ll use forever: Blue cards and a Sharpie will follow me wherever I go. The segment is set to air on March 25. Until then, here are some pictures. You can watch the whole segment on The Doctors’ youtube channel. Nice going Maria. Soon you’ll really be walking down the red carpet. I usually don’t watch these programs, but I will on the 25th. By the way, how did it feel wearing makeup? I’ll be watching the 25th! My husband keeps saying that the show is sooooo fake and prefers Dr. Oz instead. I’ve never watched this one when I am home from work but will set my DVR to see ya! Ladies, I didn’t ask him if he is still single. I just know he is. There have been no rumors really posted anywhere about him dating anyone. On a recent TV guide interview they said he was single, along with a few articles that came out. Also Dr Jim sears publicly a week or so ago came out and said he was single on his public twitter. I don’t think if he had a girlfriend all these sources would claim he was single. well guess he was dating someone back then….